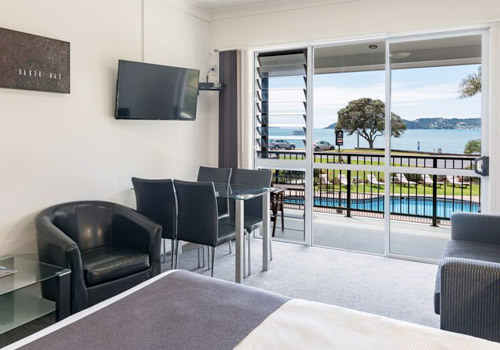 Anchorage Motel is the ideal beachfront accommodation for couples, family groups, honeymooners and business travelers whether on holiday, escaping from everyday life, here on business or looking to explore the Bay of Islands and the Far North from our perfect location. Enjoy our fresh, modern and inviting suites. 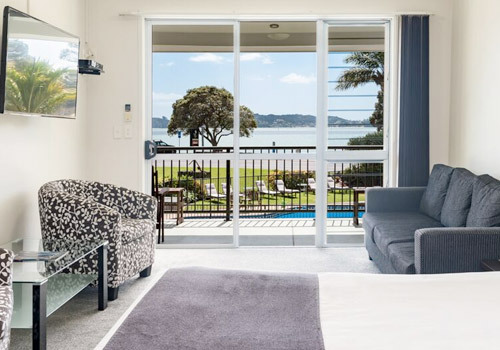 Enjoy Sky Guest Select 50+ channels and free WIFI to make it easy for you to work, or stay in touch with friends and family while relaxing in the Bay. 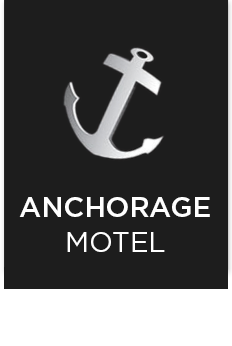 Book direct for best rates. 0800 505 100. We have availability for Christmas and New Year Bookings. Please book direct with us by selecting BOOK NOW or phone us on 0800 505 100. Lower level self contained studio suite for easy access. King bed with kitchenette and en-suite bathroom with a shower. Partial sea view. 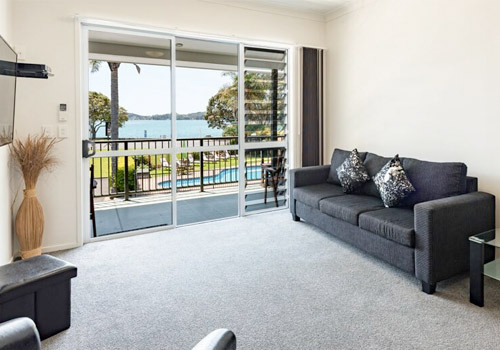 Upper level studio suite with amazing sea views. King bed with kitchenette and en-suite bathroom with shower. Upper level large self-contained deluxe studio suite with King bed, spacious bathroom with a shower over a bath. Beautiful sea views! Lower level easy access. 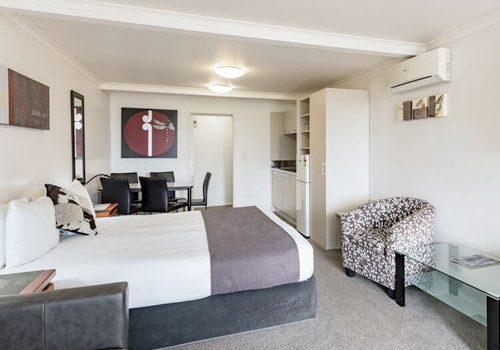 A Self-contained One Bedroom Deluxe suite with a King bed, separate bedroom with a king bed or 3 single beds. Kitchenette with a light spacious bathroom with a shower over a spa bath (Jacuzzi). 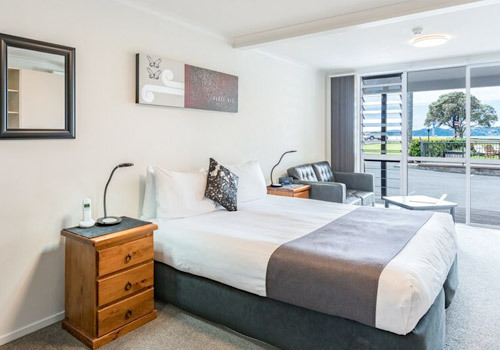 Self-contained One Bedroom Suite with king bed plus separate bedroom with Twin Beds, kitchenette and bathroom with a shower. Ocean facing with beautiful sea views! 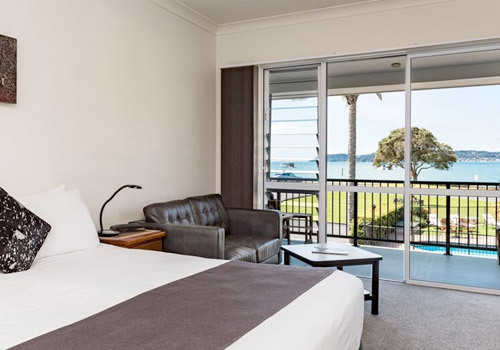 A large upper level self-contained suite with two separate bedrooms both with king beds, light and spacious bathroom with a shower over a bath, ocean facing with stunning sea views!